If you have just got your first solid-state drive (SSD) it is most probably you are in research for how to properly optimize your new drive to get it work at its best of speed and performance, and it is probable that you have found something related to AHCI mode and how the computer geeks strongly recommend using it for the purpose of maintaining the highest possible speed out of an SSD. In this article you will learn everything you need to about AHCI mode which will help you realizing the importance of this feature and why you have to enable it if you are using an SSD. AHCI stands for Advance Host Controller Interface. AHCI is the specification by which Native Command Queuing (a SATA-specific technology) is enabled. In other words it is a hardware mechanism that allows software to communicate with Serial ATA (SATA) devices (such as host bus adapters) that are designed to offer features not offered by Parallel ATA (PATA) controllers, such as hot-plugging and native command queuing (NCQ). Many SATA controllers can enable AHCI either separately or in conjunction with RAID support. AHCI is fully supported out of the box for Microsoft Windows Vista, 7 & 8. Older versions of Windows require drivers written by the host bus adapter vendor in order to support AHCI. SSDs boast incredibly fast response times. So, they realize their best performance when fielding multiple commands simultaneously, consequently benefiting from the parallelism that defines most SSD architectures. This is precisely the reason we see better benchmark performance when we use queue depths of up to 32 versus a queue depth of one. AHCI supports NCQ allowing SATA drives to accept more than one command at a time and dynamically reorder the commands for maximum efficiency. Another benefit of it is that it supports hotplugging of devices. It’s always recommended that you do a clean install of the operating system on your new drive instead of using the migration procedure that might cause some errors to the overall functionality of your system. But rest assured that even if you got your Windows on your SSD before enabling AHCI mode you will find here a solution. 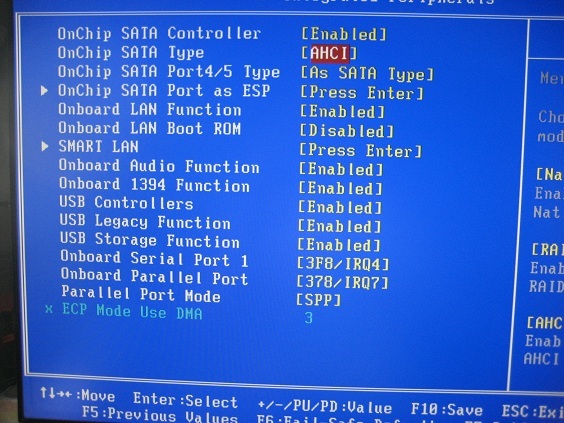 To do this: In the system BIOS, set the SATA controller for Advanced Host Controller Interface (AHCI) operation before installing Windows. This step is crucial. Using the legacy IDE or ATA mode prevents you from installing the proper disk controller driver later and will result in reduced performance. Double-click ‘System’ from the Classic View (or the small or large icon view in Microsoft Windows 7). Select ‘Device Manager’ in the left pane. From the Device Manager, look for an entry named IDE ATA/ATAPI controllers. If this entry is present, expand it and look for one of the controllers to list AHCI. If an AHCI controller is identified, then the system is in AHCI mode. If none of the controllers above are shown, then your system is not in AHCI mode. 7. Reboot Rig and enter BIOS and enable AHCI mode as laid out above.